Don’t you just looove February?! Well I sure do! One reason I adore it is Valentine’s Day in the middle of the month encourages me to find fun ways to show my kids how much I love them. Just think, wouldn’t you love to find a secret note from someone, or a little treat? It’s the simple things that make a big impact. Sure I’d love to make each child a quilt out of their baby clothes or take them all to Disney World. But I don’t have the time or money. The little expressions of love are enough. 1. Write love notes. I leave notes for my kids under their pillows and taped to their water cups. Put a love note somewhere fun. 2. Cut outs. Remember making snowflakes when you were a kid by folding paper them cutting out sections? Well why not do that for Valentine’s Day with red construction paper? Then hang them around the dining room with fruits of the Spirit written on them and take the opportunity to share why those fruits show our love for each other. 3. Read together. Sit down and read something that starts the conversation about how much you love each other and how much God loves you all. “I Love You to God and Back” by Amanda Lamb is a great one for this! 4. Bake together. My kids all have different favorite snacks. So when I want to show a special love for them, I get the ingredients together on the kitchen counter for their individual favorite and ask them to help me bake. It’s a sweet way to show you appreciate their uniqueness and spend some time together. 5. Get outside. There’s just something magical about the outside air! It give us vitamins, energy and can wash your troubles away. I often invite the kids for walks, bike rides or just to sit out on the porch with me. 6. Make a list. Give each child a list of 5 things you are proud of about them. Make sure you highlight character traits over looks or talent. 7. Say “I love you”. I hate to admit it, but I don’t say it enough. It’s not part of how I was raised, so saying I love you doesn’t come naturally. So while I’m looking for ways to express my love, I also need to remember to say it! 8. Sing a song. This is something my husband does more than I do….but it’s really fun. Just spontaneously start singing a love song to the children. Sure, it’s embarrassing for them. But what’s the fun of being a parent if you can’t enjoy embarrassing your kids? 9. Make their bed. In my house everyone makes their own bed as part of their morning chores. So in February I will sneak into their room when they are in the bathroom and make their bed really quickly then rush out. Or I look for other chores I can do to surprise them. 10. Make a treasure hunt. This one takes a little more time, but it’s super fun! Make a treasure hunt, with clues leading to a prize (candy, small toy, movie ticket, etc.). It’s easiest to start from the end and work your way to the beginning when making the clues. 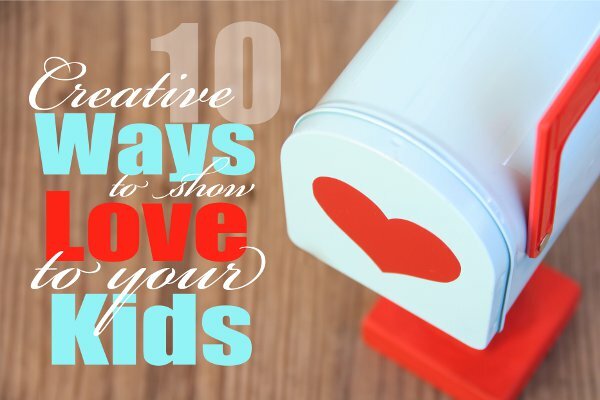 I hope these ideas will inspire you to look for creative ways to show your love to your children. Remember to do some as a group and some for each child individually. Just a few minutes and a dab of creativity is all it takes!